Cumulative values - "We can do this the easy way, or the hard way..."
In many movies, there is often a scene where the star says "We can do this the easy way, or the hard way" (and the hard way usually involves quite a bit of pain). So it is with interrogations ... and so it is with writing SAS code! 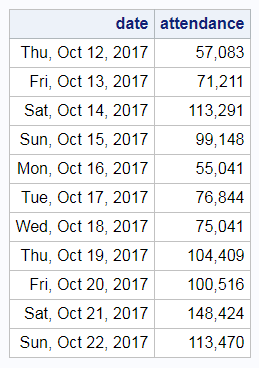 Today I'm going to teach you the easy way to calculate cumulative values. What data will I be using? 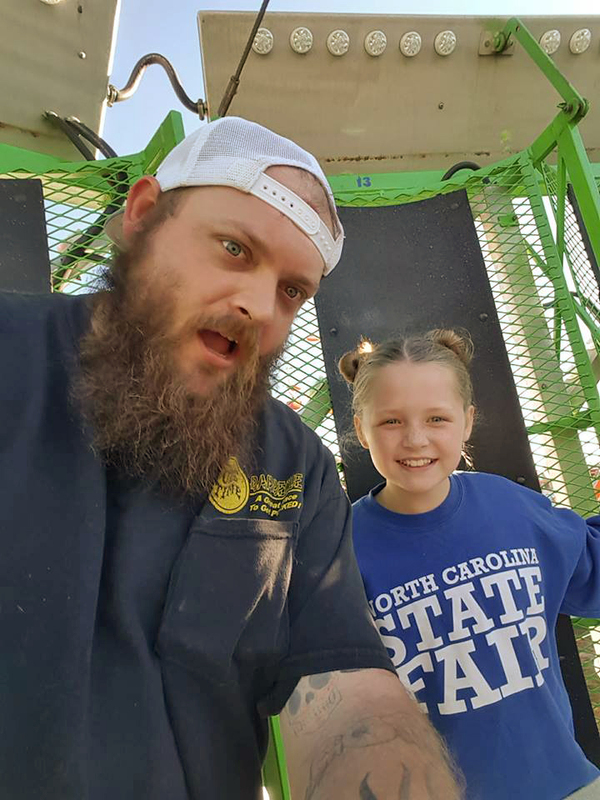 Here's a photo of my friend Ben (from Ole Time Barbecue) and his daughter, to give you a hint. 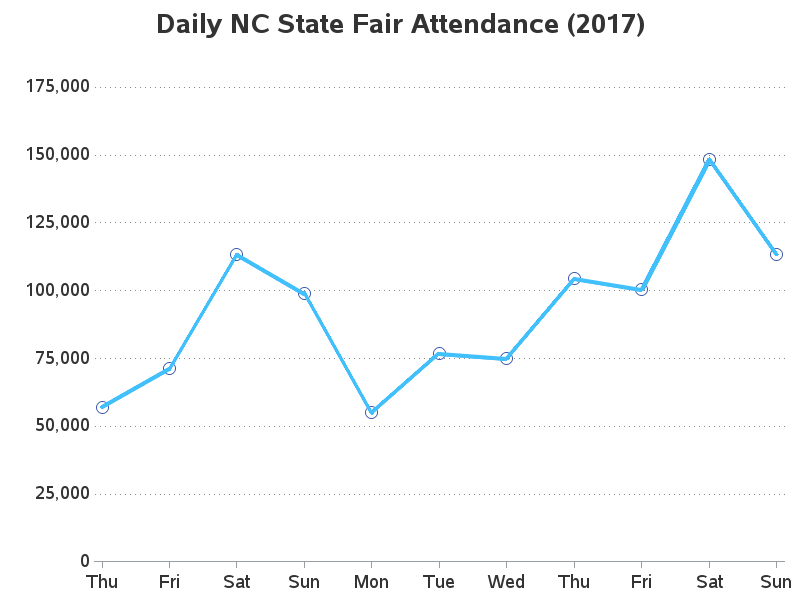 If you guessed NC State Fair Attendance data, you'd be right! 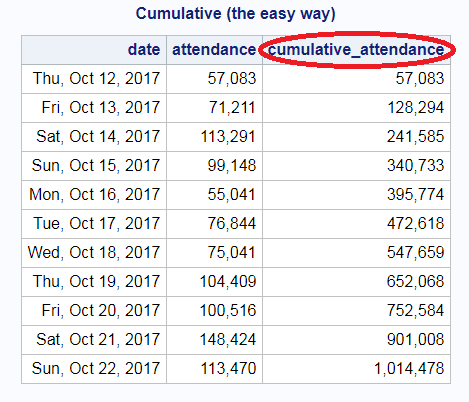 The daily attendance is nice to see, but the cumulative total would also be interesting. You can calculate the cumulative total in SAS using a data step. A data step loops through all the lines of the dataset (one line at a time), and lets you perform actions on the values. By default, you can only perform actions on the values of the current row, but you can use the 'retain' option which allows you to carry a value from one row of data to the next. You programmers out there are probably saying "that's not too bad - just three lines of code in a data step..." But that's actually the hard way. There's an easier way to calculate the cumulative total, using only one line of code in the data step! I learned this trick from Dr. David Dickey, while taking his Time Series grad course at NC State University in the 1990s (Thanks Dr. Dickey!) As you can see, the results are exactly the same ... but the code is a lot more concise, which makes it easier to maintain and less prone to human error. 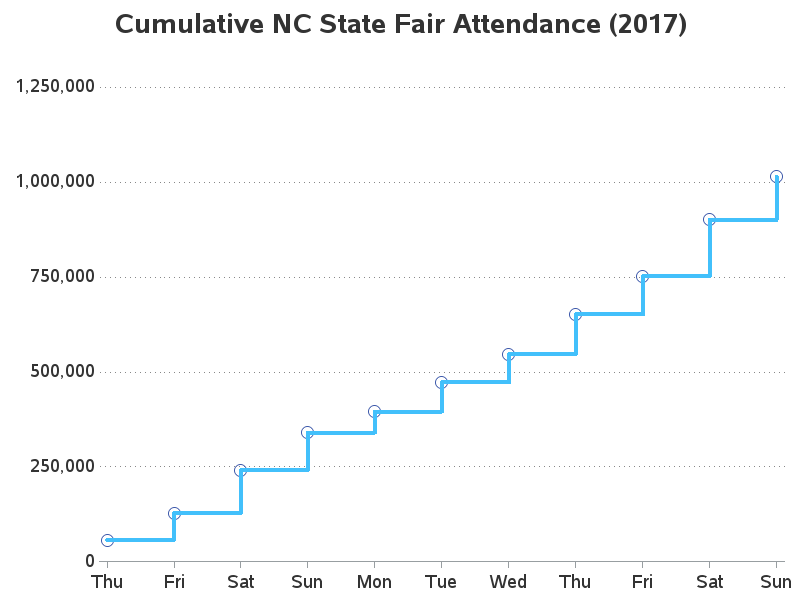 Now that we've got the cumulative attendance for each day, let's plot the data. When plotting cumulative data, I like to use the steplj interpolation (step, from the left, and join the points with a line). 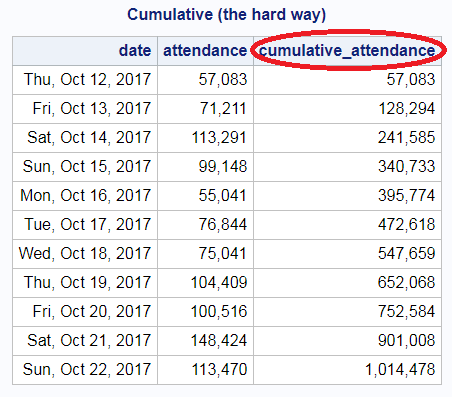 Now you can see when the cumulative attendance crossed the 1,000,000 mark in 2017 - it was during the final Sunday. Disclaimer: I do not know how to format code in this comment editor, so please accept my apologies for the mess. I have intentionally kept 1 and 2 distinct in that list, even though "retain x 0;" would perform both activities in one statement. In my experience, I have always found more lines of code that do one thing clearly are much easier to maintain than clever language shortcuts. In my SAS code, retains are frequently combined with by-groups. In that situation, having a "if first.by_variable then do; *initialize all retained variables; end; retain x y z ...;" is my preference.